Pallet conveyor technology primarily requires economical drive solutions with high overload capacity. 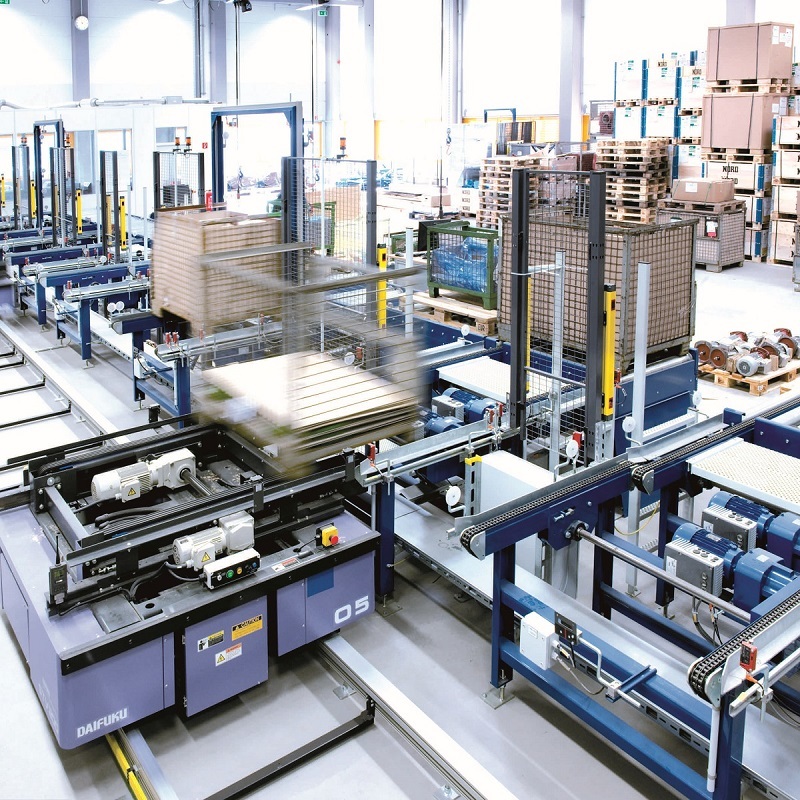 Nord Drivesystems supplies optimally matched, individually configurable and flexible drive technology which reduces the number of versions and minimises costs, especially for transporting pallets and cage pallets with roller or chain conveyors. For simple pallet conveyor technology applications, Nord has developed an efficient drive combination consisting of an asynchronous motor and a Nordac Base frequency inverter. This drive solution is specially tailored to the requirements of pallet conveyor technology and provides dependable technology with a robust design. It can be combined with all Nord geared motors and can be flexibly extended according to requirements, or the customer's specifications. Standardisation results in a reduction of the number of versions. This considerably reduces stocks of spare parts, optimises maintenance and saves costs in the sense of TCO (Total Cost of Ownership). The three-phase asynchronous motors provide powers up to 1.5 kW and feature high overload capacity, solid workmanship and a long service life. The frequency inverters are installed close to the motor and are equipped with an integrated PLC. The freely programmable PLC processes the data from sensors and actuators, provides diagnostic options and communicates with the higher level controller. A pre-installed software for control, parameterisation and diagnosis is configured for the special drive requirements of pallet conveyor technology. The drive units can be integrated into all common bus systems. The AS interface or I/O interface are especially suitable as a simple and cost oriented solution for communication in pallet conveyor technology. A different bus system can be used without any problems if there are more sophisticated requirements.